Heading to the Ariana Grande concert? You might want to think before you pack. Heightened security measures are temporarily in place for Wednesday night’s show at Scotiabank Arena in Toronto. Fans who want to bring a bag into the concert are only allowed to carry a “100 per cent clear” plastic or vinyl bag that is a maximum size of 30 cm x 15 cm x 30 cm. The restrictions have been posted on the screen outside the arena with pictures that show what an approved bag may look like. Fans who bought tickets to her Sweetener or Thank U Next tours received an email notifying them of the rules. Any bag that is not see-through will not be permitted into the concert. The move comes in the wake of a bombing outside a Grande show in Manchester, U.K. in 2017. The attack, which ISIS claimed responsibility for, left 22 people dead and 59 others injured. 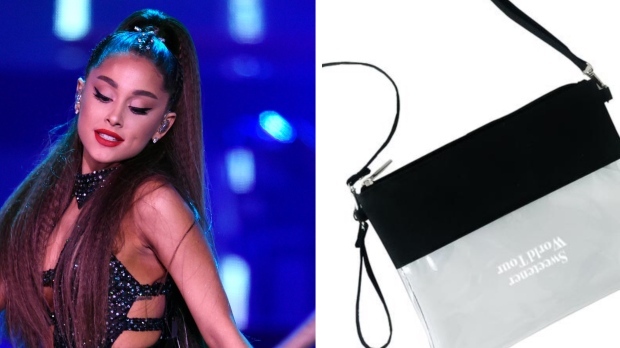 In an Instagram post, the popstar showed off a version of a clear bag fans would be allowed to wear. “Security is going to be very precise and smooth but for sure super strict,” Grande wrote in the February post. Those who don’t already own a clear or PVC bag have been encouraged to purchase one from the tour. The Grande-branded bags include a wristlet with straps, a tote bag or a fanny pack. Each bag costs around $10 CAD. “They’re super cheap and simple but having them ahead of time will for sure help things go as smooth as possible,” she wrote. The concert begins at 8 p.m. Grande will return to Toronto for a second show in June.